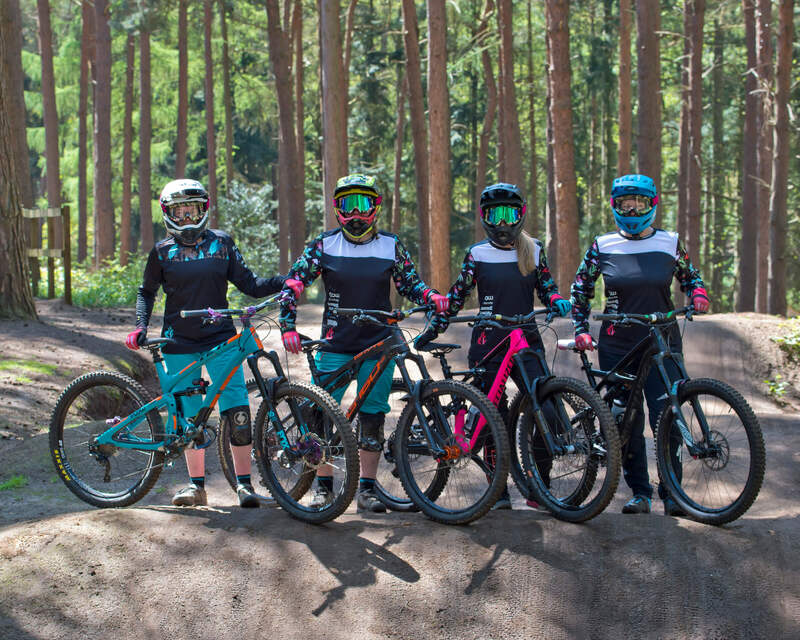 Flow MTB are proud sponsors of a women’s MTB race team. In what is still a male dominated sport we think it’s important to support the women getting out there and taking part in the race scene especially at a grass roots level. For 2018 we are supporting a mix of riders across multiple MTB disciplines; downhill, enduro and 4X. Emily’s cycling began on the road, racing triathlons as a teenager, but she fell out of love with it until she started mountain biking in her 20s, now she can’t get enough of it and manages to squeeze bike related adventures into most weeks either on the trails, dirt jumps or at the skate park. For 2018 Emily will be racing some of the Onza Mini Downhill races at the Forest of Dean and is hoping to get entries for the Pearce series and British National Downhill races. With her first trip to Whistler planned as well as setting herself a few personal challenges with jumps it looks like 2018 is going to be a great year on the bike for Emily. Emma absolutely loves riding her mountain bike whether it’s socially or more recently racing. 2017 was Emma’s first season racing and she really caught the bug picking up some great results along the way. For 2018 Emma’s main focus is on enduro racing with Ard Rock Enduro, Welsh Enduro series and the PMBA Enduro series but she’s also going to give downhill racing a go starting in January with the first round of the 2018 Onza Mini Downhill. Anna loves riding her mountain bike, skiing, snowboarding… anything outdoors really! She’s been mountain biking for a couple of years but had never really thought about racing until last year when she entered the PMBA (Pennine Mountain Bike Association) Enduro series, the first being at Kirroughtree in Scotland where she picked up 4th place. This was followed by the Welsh Enduro at Llandegla, another PMBA at GNAR and the Red Bull Foxhunt where she came 12th. For 2018 you’ll see Anna at both enduro and downhill events starting in January with the first round of the 2018 Onza Mini Downhill. She’s also managed to grab herself a ticket to the ‘Ard Rock Enduro. Rebecca joins the team again for another year. Rebecca spends as much of her spare time as she can having adventures! She races downhill, climbs mountains, enjoys the outdoors and can’t wait to get involved in pretty much any kind of muddy adventure. The 2017 race season didn’t go quite to plan for Rebecca. After a great start to the season and plans for national races through the summer plans were put on hold after she broke her collar bone at Black Mountain Cycle Centre. Five months off the bike in recovery and she chose the final round of the BDS for her return. For 2018 you’ll see Rebecca racing downhill at the Onza Mini Downhill series, Pearce Cycles Downhill Series, Racers Guild Downhill Series, Malvern Festival. You’ll also see her giving enduro a go at the ‘Ard Rock Enduro. Michelle Muldoon or “Ginga Ninja” to her biking friends is a privateer mountain biker and Physical Education Secondary School Teacher in Ireland. Michelle races enduro MTB both in Ireland and internationally spending her summers travelling around Europe in her race van following the enduro race scene, riding epic trails and meeting new people everywhere she goes. As one of the fastest female riders in Ireland she’s made the podium in almost every round of the Gravity Enduro Series since 2013, and is currently ranked 2nd in the country. Michelle is an Ambassador for Cycling Ireland and a fully qualified ‘Gearing Up Off Road’ and Trail Cycle Leader with experience coaching beginner women’s biking sessions. Originally from Devon Heather grew up loving all outdoor activities and extreme sports. At 18 Heather moved to France and after passing her A levels headed to the Alps where she lived for 7 years. On moving back to the UK in 2011 Heather did a bit of surfing, kayaking, and climbing but it wasn’t until someone mentioned Gawton’s DH trails to her that she got her bike out again. The locals persuaded her to try competing and she took the SW Champ title in her 1st race and was hooked, competing in local events and then racing further afield. Since then she’s competed in downhill, enduro and 4X races picking up podiums in all three disciplines. For 2018 you’ll see Heather at the Welsh Gravity Enduro Series, Welsh Enduro Series, UK Gravity Enduro and 4X events. MTB Instruction: Supporting our riders with skills coaching. Phil Corley Cycles: Supporting our riders with bike servicing and maintenance.